Once upon a time, there lived two rodents in a town. One lived in a go down and was very happy there, feeding on the grain in storage: the other lived in a lovely vegetable garden and was very proud of the fresh food he got to eat everyday. One day, the go down rodent wandered in to the garden and came across the other rodent. "Hello there! What do you say to get my son married to your daughter?" The garden rodent laughed. "Look at where I live! In this beautiful garden! And you live in that ugly go down with no fresh air. Why would I consider your offer? The boastful rodent walked up and down his garden, rusting the sugarcane stalks in the process. "Have you ever seen such fresh, juicy vegetables and fruits? Will my daughter fined that in your boring old go down?" As the rodent babbled on, a vulture was circling the air above, looking for prey. His sharp eyes caught the movement below in the garden. "What's that?" the vulture thought, wondering if he had found his lunch. He swooped a little lower to see what animal was moving around below. The proud rodent continued to strut around, showing off, while the other rodent listened quietly. "But I have plenty of grain in my go down. Your daughter will be very happy there," said the rodent, defending his home. "Pooh! Your grain cannot compare with my delicious food and clean air. The sun shines brightly here, and the blue skies are so pretty! Your dingy go down will never have that!" As the haughty rodent continued his tirade, the vulture circled closer and closer until he was nearly a few yards away from him. Suddenly, he flew straight at the garden rodent and grabbed him in his sharp beak. The go down rodent shouted," where are you going? Why are you leaving me behind?" "I am going to the king's place for a celebration! Please take care of my house until I return!" said the garden rodent not wishing to show that now he was mere prey. 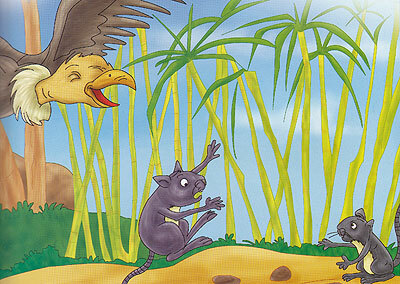 The vulture thought, “what a silly rodent to say such funny things even when he knows he's about to die!" Unable to contain his amusement, the vulture burst out laughing. His beak opened and the garden rodent fell out! Quickly, the lucky garden rodent ran into his burrow, thanking his stars and vowing to talk less in future.